England are one of the two oldest national teams in football; alongside Scotland, whom they played in the world's first international football match in 1872. England's home ground is Wembley Stadium, London, and the most recent team manager was Roy Hodgson, who resigned after a 2–1 loss to Iceland in Euro 2016. Although part of the United Kingdom, England has always had a representative side that plays in major professional tournaments, though not in the Olympic Games, as the IOC has always recognised United Kingdom representative sides. England contest the FIFA World Cup and UEFA European Championship, which alternate biennially. In contesting for the World Cup seventeen times over the past sixty four years, England won the 1966 World Cup, when they hosted the finals, and achieved an semi final appearance in 1990. England have never won the UEFA European Football Championship – after fourteen attempts over fifty two years, their best performances were semi final appearances at the 1968 and 1996 Championships, the latter of which they hosted. 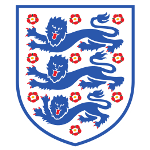 Having never won the UEFA European Football Championship, nor any recent FIFA World Cups, England have never qualified for any of the 10 FIFA Confederations Cups, contested over the history of that major international tournament for national teams.